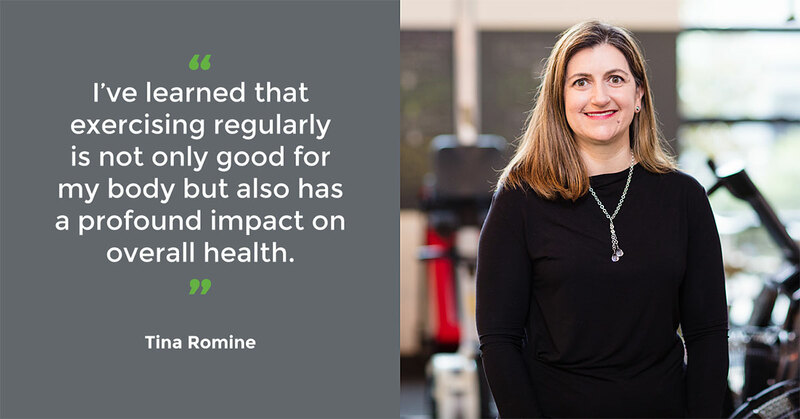 Tina Romine’s level of dedication to her health and fitness is apparent by how much stronger and more capable she has become. She’s lifting more weight, moving more athletically, and taking control of her health through diet. When not training with her trainer Dustin, she’s in the gym, putting in solid work. Of course, she also makes time for weekend trips to Mt. Rainier or for pizza at a newly discovered pizza joint. Length of time with Hyatt Training and date when you started: 18 months. I started training at the studio in June 2017. What were your goals when you started? My goals when I first started were to improve my overall physical fitness and strength and to establish a sustainable routine. What are your goals today? Today my goals have expanded to include a focus on weight loss and nutrition. What have been your biggest areas of improvement? The biggest areas of improvement have been in my overall strength and the loss of some inches – thanks to the challenging workouts that Dustin prepares for me each week. What is your favorite thing about Hyatt Training? My favorite thing about Hyatt Training is the community that Jeremy and Lee have developed because it makes being at the studio a very enjoyable experience. I’m always happy to be there and it seems like everyone else is too! The environment is very friendly and supportive. What is your favorite thing about your personal trainer? Dustin does a great job of planning my workouts so I am always challenged and never get bored. He is great to work with and I look forward to meeting with him each week even for the most difficult workouts. What is your proudest achievement or biggest accomplishment since you began working with Hyatt Training: I have seen positive improvements in the shape of my body and now have a good routine for strength training. What have you learned: I’ve learned that exercising regularly is not only good for my body, but also has a profound impact on overall health by improving stress levels, mindfulness, mood, etc. What advice would you give to other people starting on their fitness journey? “Be good to your body, it’s the only place you have to live” (Native Cos.) – I like this quote and think about it often. My advice would be to take the first step and get started because sometimes that is the hardest thing to do. Hyatt Training can help you get started and headed in the right direction!